A few things about this pie: 1) it has an oatmeal cookie crust. The crust itself – and I imagine you could swap a gingersnap, graham cracker or other cookie crust, or even a blind baked pastry crust – was perfect for people intimidated by pastry, and grainy crumbles always go well with fruit. It held up well, and was a bit chewy – I’m a fan of straight-up pie crusts, but imagine this could take its place with all kinds of fillings. But a rhubarb-custard pie is a good start. 1Preheat the oven to 350F. In a medium bowl, combine the oats, flour, brown sugar, cinnamon and salt. Add the butter and blend until crumbly; press into the bottom and sides of a 9-inch pie plate and bake for 15 minutes, or until pale golden. 2To make the filling, combine the rhubarb, 3/4 cup of the sugar and the cornstarch in a medium saucepan. If you like, add a splash (a couple tablespoons) of water or orange juice to help get things going. Bring to a simmer and cook, stirring often, until the rhubarb breaks down and the mixture thickens. 3Spread the rhubarb in the pie crust and in a medium bowl, whisk together the sour cream, cream, remaining 1/2 cup sugar, eggs, vanilla and salt. Pour over the rhubarb and bake for 30-40 minutes, until the pie is golden and set around the edges, but still a bit wobbly in the middle. Cool, then refrigerate for a few hours, until chilled. Both crust and filling sound so yummy! HI – I think the sugar (1/2 cup) is missing in the directions for the custard filling. Have this in the oven now and can’t wait to try it — I’ll either have to stay up late until it’s cool enough, or try it for breakfast. My wee rhubarb is only up about 3 inches (long drought) but now that rains have come I’m sure it will be shooting up soon. 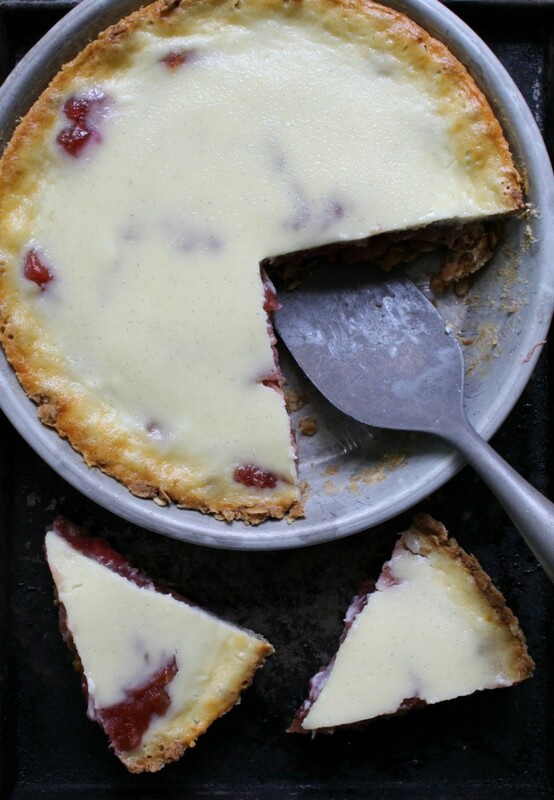 So want to try this as I fondly remember a Bee Bell bakery rhubarb custard pie that my Mom and I shared in the car one sunny Saturday morning right outside the bakery! I used chocolate evaporated milk and the flavor is awesome!!! Wow, so interesting! I never would have thought of that! I just made this for dessert and it was fantastic! Thanks for sharing! Rhubarb lover drooling here. Rhubarb in any form works for me, although my fave is straight up rhubarb. I will be making this recipe with gluten free flour for the gluten free daughter as soon as the spring rhubarb pops up far enough to use. Bring on spring! Hi Julie, so thrilled to try this recipe! If I want to add strawberries to the filling would I reduce the rhubarb and would I add them to the rhubarb filling when cooking or after. Thanks for your help! Yes, I’d just swap strawberries for some of the rhubarb! Yum!! 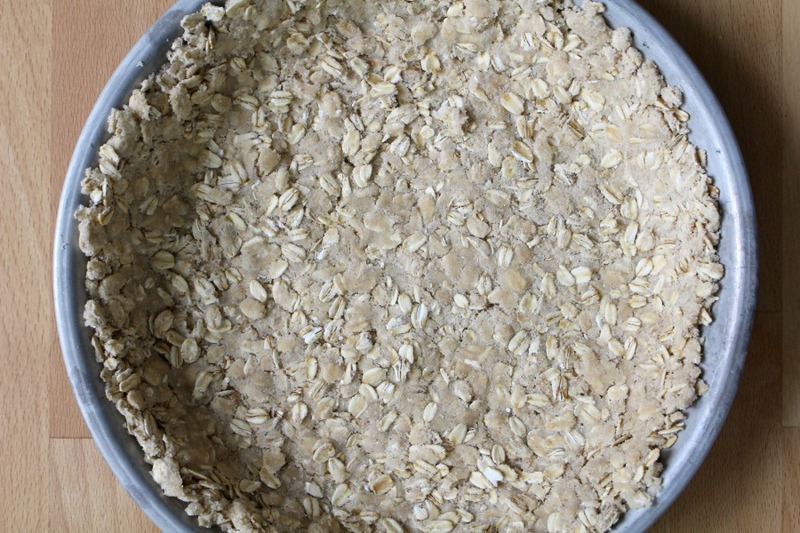 Do you use quick oats in the crust or old-fashioned? Either would work – just not instant! This recipe just sounds so amazing! I am such a fan of rhubarb and I am watching my plants coming up, so I will look forward to trying this very soon now! Can’ t wait! Sooo good!! I have a ginormous rhubarb plant and had no clue what to do with it. This was my first attempt at baking with it and it will not be my last. I swapped out a bit of the rhubarb for peaches that I canned last year and used gluten free flour. Yum! I made this last night, was a bit weirded out by the sour cream but I persevered and was glad I did. It was totally delicious. I mistakenly took out frozen plums not rhubarb but means I can make a rhubarb one another time. Was totally gorgeous. I also found it easier to melt the butter then mix in the oats and dry ingredients. One question. Do you think the left overs could be frozen? Hmm.. it’s worth trying, but custard tends to go funny once frozen and thawed. 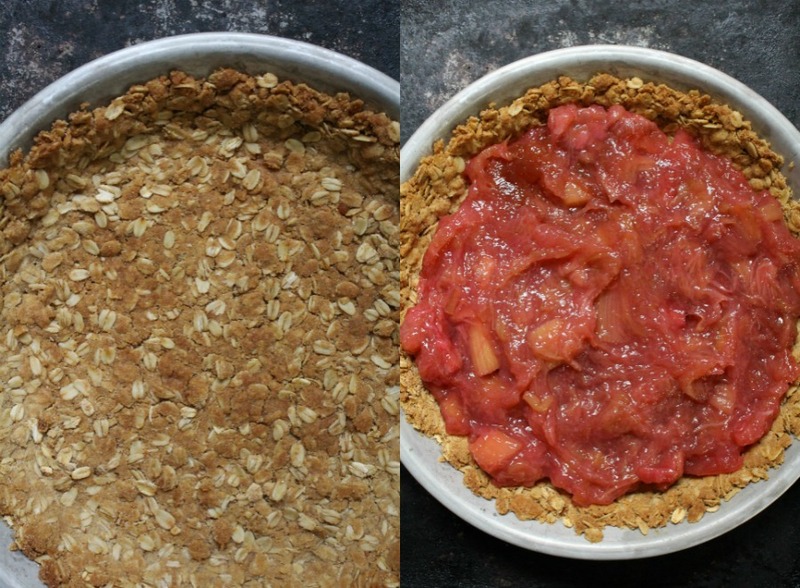 I made this for my husband, since he grew up with rhubarb pies. I made a classic rhubarb pie previously, and this rhubarb custard pie absolutely blew it out of the water. Even with my ghastly mistake of leaving out heavy cream (which i will not repeat next time), my husband held the plate to his face and shoveled the pie in his mouth. The crust was chewy, but absolutely perfect. I will make this over and over again. I doubled the crust recipe to fit the pie pan I had, added about an extra cup of rhubarb and just a bit more sugar, but changed nothing else except for the heavy cream I forgot. Looks amazing! What would I change in order to use frozen rhubarb? Or thaw first? I was hoping you’d say that. Thanks! This recipe looks incredible! I can’t wait to try it this weekend! I was wondering if I could swap the sour cream with greek yogurt. Thanks! Worth a try, as long as it’s not fat free yogurt! Made for dessert tonight!! !….so good!!? Hi! I think the heavy cream is missing in the recipe – do you at it when making the custard? Thanks! Along with the sour cream – it’s in there! I cannot eat eggs, due to an allergy… I used 3 cups of prepared (rhubarb simmered in water with 1/2c sugar), 1/4c brown sugar, 3 tbsp tapioca with the corn starch, omitted the eggs and mixed all of the ingredients together.poured it into the parbaked shell and baked it for 45 min… it was fabulous…thank you for such a beautiful recipe, I hope you don’t mind the tweeks. Ooh yum! so glad to hear it! AMAZING,I cannot wait to make this. I have this in the oven right now. Pinned the recipe. Thanks for sharing. I have this in the oven right now and I have high hopes for it. I’ve made many many rhubarb pies in the past and sadly, they were not good. 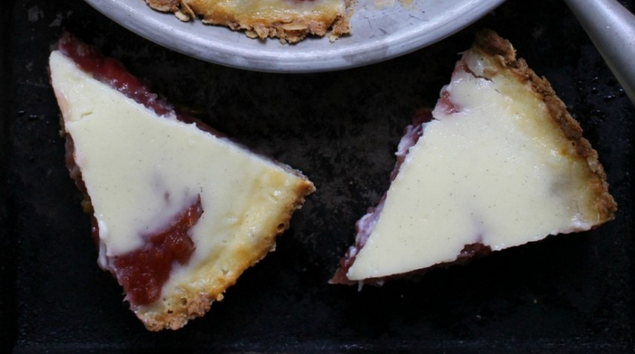 This one is so different from all the others and I really want it to be delish as I love rhubarb. I’ll let you know! Okay, I’m letting you know! This pie is fabulous and I will be making it again and again! Thank you so much. Is it eaten day-of or can it sit a day or two? It can definitely wait a day or two! I don’t think it’s ever lasted more than a day at my house! but it should be fine, the crust perhaps not as crisp after a day or two. saskatoon berries…..that is a awesome combo! OOOOH, that sounds like a fab combo here!! This is my favourite dessert!! I made it for a summer party last year and everyone LOVED!!!! I didn’t have quite enough rhubarb, so I put saskatoons in it as well. The perfect combo! !